Thanos is a super villian in Marvel’s Avengers: Infinity War and Guardians of the Galaxy. He is searching the universe for the infinity gems that will complete the infinity gauntlet. The infinity gauntlet will make Thanos the most powerful super villian in the universe. 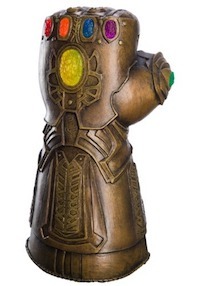 The infinity gauntlet is to be used to wipe out half of the life on earth. 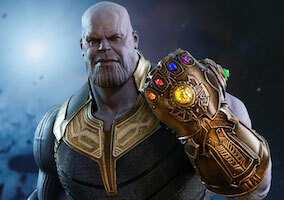 Thanos searches for the six gems from various superheroes in the Marvel universe and are referred to as Infinity Stones. Thanos was finally able to collect all the stones in the last Avengers movie. The Purple Power Stone he got from Star Lord, the blue teleportation stone he got in Odin’s vault, the red Reality stone he got from Thor’s Dark Elf Malekith, orange Soul stone he got from Gamora, the green Time stone he got from Doctor Strange, and the yellow Mind stone he got from Loki. Thanos activated the gauntlet and started the annihilation of life, the superheros starting crumbling into ash and and blowing away. Get a chance to hold the power of the universe in your hands. You too can dress up as Thanos. 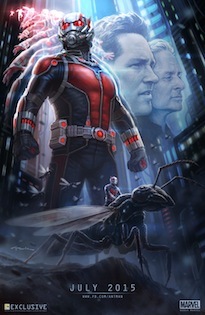 Click here for other Marvel costume ideas. 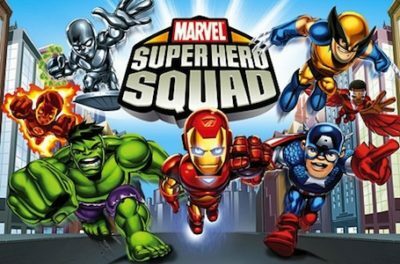 Find Marvel Thanos costume ideas below. This Marvel Legends collectible comes from the movie, The Avengers: Infinity War. The gauntlet is made out of a rigid plastic with articulated fingers and thumb. The exterior has a faded antique brass color and molded texturing to create a highly realistic appearance. The gauntlet also has each of the “Infinity Stones” in the knuckles, which light up. The gauntlet even makes real movie sounds. It makes for a great collectible or a final piece to your Thanos costume. This Infinity War adult Thanos costume brings you a look inspired by the iconic villain from the movie. It comes with a printed jumpsuit that’s designed to make you look like a Titan. The chest has faux armor, while the arms have a purple muscular look. The boot covers fit over your shoes, so you can wear your favorite pair of sneakers while you dress up as Thanos. It even comes with a molded mask, which turns your face into that of the Mad Titan himself! 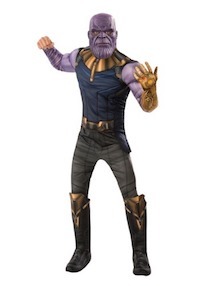 Click here to get Deluxe Thanos Costume for Adults. 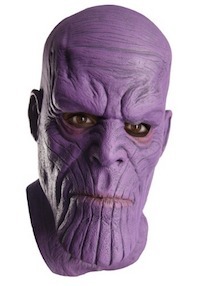 This Marvel Infinity War Thanos mask is molded to make you look like the one and only mad titan. The mask is molded to have all of his features, including his broad jaw, the vertical scars along his chin and his furrowed brow. The exterior is a dim purple color, which recreates the look from the movie. Just slip this on and you might find yourself cooking up plans to defeat the Avengers. 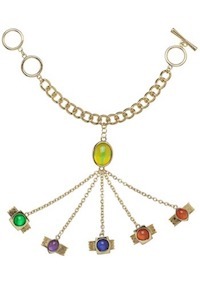 This infinity bracelet includes all the infinity stones. Click here to get the Thanos Infinity Bracelet. 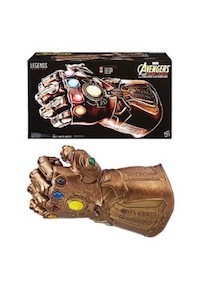 Capture the end of the most powerful rainbow ever with this officially licensed Infinity Gauntlet from Marvel’s Infinity War. This latex glove has an incredibly detailed surface and a bronzed look that makes the thing look incredibly potent. Each of the Infinity Stones is represented with faux gems fixed into the knuckles and back of the hand. Click here to get Adult Thanos Costume Gauntlet.